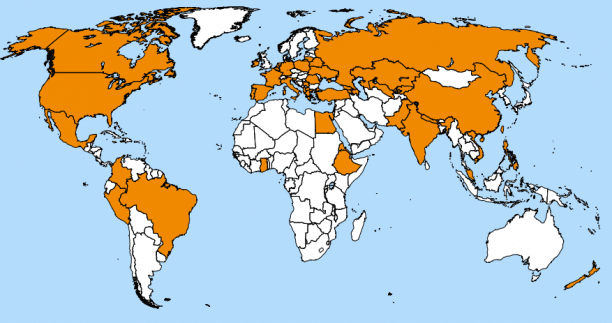 Students come from all over the world to join the ASC master ! Watch Sailendra’s video on Youtube. I was born in Kazakhstan and had ambitions to travel around the globe. After stays in the USA and Taiwan, I was delighted to be awarded an ASC scholarship to study in Europe. During this 2-year long Master’s programme, I studied in France, Germany and Finland followed by a thesis at the European Synchrotron Radiation Facility (ESRF, France). This unique programme gave me the opportunity to travel across the Europe while obtaining top-notch multiple degrees from universities in the three European countries. The mobility is a key feature in the programme and should be chosen carefully depending on the candidate’s career preferences. I obtained amazing international experience combined with advanced professional skills. After being awarded the MSci degree I was getting job offers from around the globe from Australia to Canada and landed an excellent PhD position in the Netherlands. I’m well on my way to shaping my future academic career. I was awarded an Erasmus Mundus scholarship and concluded the ASC Master in 2013. Throughout the programme, I acquired knowledge about several spectroscopic techniques and related subjects. Being a pharmacist, I chose asymmetric organic chemistry as the topic of the thesis, which I believe is an example of the range of opportunities the programme may provide. After graduating, I returned to my home country, Brazil, and got a position at ANVISA, a regulatory agency which plays a role somewhat equivalent to that of the Food and Drug Administration (FDA), in the United States, or the European Medicines Agency (EMA). I currently work at the Post-Approval Changes Office and my job involves verifying the compliance of files with pharmaceutical regulation. Even though I am no longer in academia, the knowledge acquired in the ASC Master is of great importance in my profession, since I often need to assess spectroscopic data in the analysis of new synthetic routes for drug substances and quality control and stability studies for drug products. Jie Yang (2009-2011) has a PhD position at Ecole Polytechnique in Paris. I was offered with the Erasmus Mundus scholarship and joined the ASC program in 2009-2011. In this program I learned many useful and interesting subjects about various spectroscopic techniques. From them, I chose the direction of localized surface plasmon resonance (LSPR) applied in bioanalysis (DNA). With the obtained training experiences, I then obtained a PhD thesis scholarship (2011-2014) from Ecole Polytechnique and joined the lab of condensed matter physics to study the elaboration of glycan biochips applied in proteomic analysis (sensing and screening) using silicon-based thin films. This work offered me a great space and honor to develop the technique for biomedical applications. I am proud that some of the essential results have been published in chemical journals. In this thesis, I feel that the multidisciplinary course trainings and lab internship experiences in different collaborative universities of the ASC program were highly helpful to handle my work, like the characterization of surface functionalization (IR, AFM, XPS, etc), the organic and polymer synthesis (NMR, MS, etc), bioanalysis techniques (SPR, LSPR, etc). It has been two years since I graduated from the ASC program, but the three letters always bring back fresh memories and a smile to my face when I think of the two years that I have spent with ASC program. To me, ASC offers a perfect mixture of academic development and cross-cultural communication. The first year’ intensive courses unfold a wide spectrum of art-ofstate spectroscopic technologies, which altogether form a solid theoretical foundation for the master project undertaken in the second year, in a different country! I can still remember the days that we were bombarded with profound quantum theories, the nights that we stayed up for preparing presentations, and the holidays that we couldn’t relax because of all the reports due. ASCers are true warriors, who fight with tough mind and sharp intelligence. The amazing ASC experience also involves moving, integrating and sharing. My mobility plan constitutes of one year in France and the other in Poland, which allows me to have a taste of two fairly different cultures and meet with students from all over the world. The opportunity to see, to travel, to understand is a real blessing because it has ever since transformed me into someone with an open mind and global horizons. ASCers are also real adventurers, who are fearless in face of changes and dare to embrace the world. After graduation, I returned to China and started my career as a formulator for hair color products in L’Oreal. There is little doubt that my experience in France was an advantage in my job application. Though spectroscopy seems very far from cosmetic products formulation, what I learned from ASC experience still proves to be highly beneficial to my work. To start with, spectroscopic technologies are widely used to characterize the structure and properties of hair fibers in a way that they provide important information for the evaluation of the product performance. The other two important lessons that ASC has taught me — the ability to adapt to the new environment and the passion to learn new things — have also been great support when I am faced with new challenges at work. In the end, I am truly grateful for the ASC experience and I wish all the lovely staff and my dear colleagues great happiness in life.